In a previous work, we introduced an input/output variant of stochastic automata (IOSA) that, once the model is closed (i.e., all synchronizations are resolved), the resulting automaton is fully stochastic, that is, it does not contain non-deterministic choices. However, such variant is not sufficiently versatile for compositional modelling. In this article, we extend IOSA with urgent actions. This extension greatly increases the modularization of the models, allowing to take better advantage on compositionality than its predecessor. However, this extension introduces non-determinism even in closed models. We first show that confluent models are weakly deterministic in the sense that, regardless the resolution of the non-determinism, the stochastic behaviour is the same. 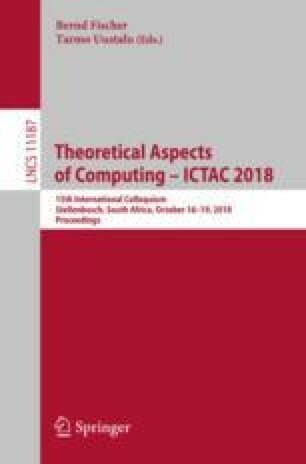 In addition, we provide sufficient conditions to ensure that a network of interacting IOSAs is confluent without the need to analyse the larger composed IOSA. This work was supported by grants ANPCyT PICT-2017-3894 (RAFTSys), SeCyT-UNC 33620180100354CB (ARES), and the ERC Advanced Grant 695614 (POWVER).